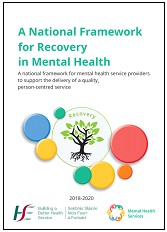 A National Framework for Recovery in Mental Health: A national framework for mental health service providers to support the delivery of a quality, person-centred service. 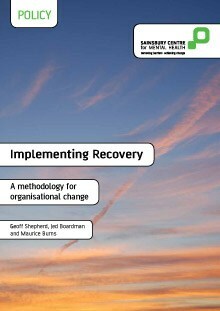 It is over ten years since A Vision for Change: Report of the Expert Group on Mental Health Policy (2006) identified recovery as a central value informing and underpinning what was then a new and exciting mental health policy. The importance of lived experience and peer led services has become more established with innovations such as Recovery Education, Peer support and Peer led involvement centres. However there remain variances across the service in relation to the understanding of, commitment to, and measurement of, recovery. 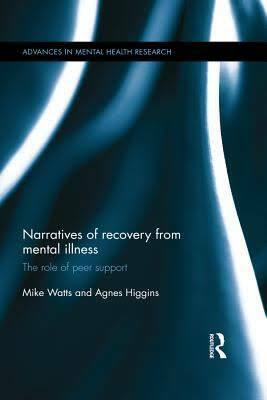 The HSE wishes to begin to address these variances through the development of this "National Framework for Recovery 2018-2020"
Narratives of Recovery: The Role of Peer Support’ by Dr. Mike Watts, former National Programme Co-ordinator with GROW and Prof. Agnes Higgins of TCD Nursing & Midwifery. The book was launched by Patricia Gilheaney, Chief Executive of the Mental Health Commissionand was held in Trinity College’s School of Nursing and Midwifery in D’Olier Street, Dublin 2. It features the personal recovery stories of 26 GROW members and their journey in rediscovering a ‘re-enchantment with life’. The book discusses the process of personal liberation and healing which assists recovery, and suggests that friendship, social involvement, compassion and nurturing processes of change are key factors in improved mental wellbeing. Mental health services need to change radically to focus on recovery. They need to demonstrate success in helping service users to get their lives back and giving service users the chance to make their own decisions about how they live their lives. Recovery turns mental health services' priorities on their heads. Traditional services wait until a person's illness is cured before helping them to get their life back. Recovery-focused services aim from day one to help people to build a life for themselves. The medical care they give is in support of that bigger purpose. Recovery and personalisation both challenge the current predominance of professional, clinical knowledge over the expertise of lived experience in the mental health system and require significant changes in the culture, practice and organisation of mental health services. 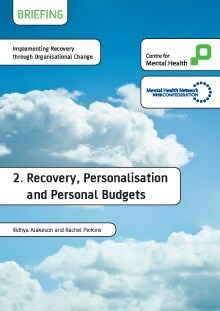 The purpose of this paper is to explore the links between recovery and personalisation and demonstrate how both are part of a common agenda for mental health system transformation. While personalisation is a more recent concept, it builds on approaches that are already underway as part of recovery-oriented practice. 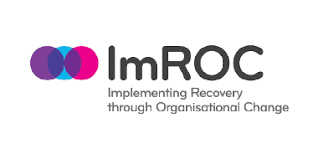 27 OCTOBER 2017We are delighted to share with you the latest ImROC briefing papers, Recovery: the Business Case and Co-production – Sharing Our Experiences, Reflecting on Our Learning. We welcome your views on these papers and hope they are helpful in further developing Recovery-orientated practice through your current and future work. ​​Supporting recovery in mental health services: quality and outcomes aims to help organisations in the mental health sector develop clear, empirically-informed statements about what constitutes high-quality services, and how these will lead to key recovery outcomes for service users. Continuing to be me’ – Recovering a life with a Diagnosis of Dementia launched today as part of the ImROC briefing series, explores the parallels between ‘person centred care’ and ‘Recovery-focused practice’. 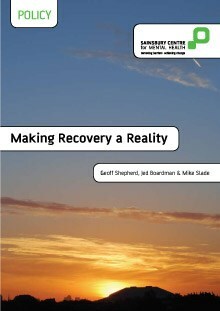 Traditionally recovery concepts; hope, control and opportunity have been considered through the lens of younger adults until the release of today’s briefing paper.